Today this is a new tutorial on the great Citrus Engine framework. 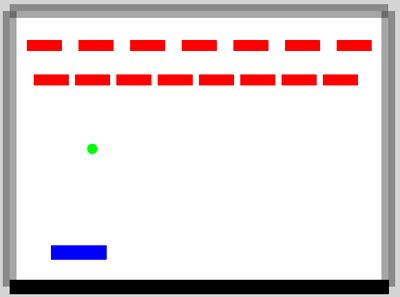 Before starting my school project, I wanted to try using box2D inside the Citrus Engine, so I will show you how create a breakout game ! Click here to play the game, don’t forget to click in the swf to enable keyboard. – instead of using sensor to change the way that baddy moves (if they will fall), you can now specify a limit with leftBound and rightBound parameters. A nice feature added by Eric ! – it is possible to create cloud plateform by setting the proprety oneWay to true on a Plateform. It will enable you to jump on even if your are below. – with the new update we can create a MovingPlatform as a new class of the core engine. Ok, now let start the tutorial. With the Citrus Engine, we can use Flash IDE as a Level Editor. It is really easy to use it and so powerful ! You can save lot of time. You can add easily some parms. Our level is now created. Compared to the last tutorial the main change are console command and the loader for our level. Now the GameState which show how access to our MovieClip’s level. It is really easy to access to our objects from the swf with these functions : getObjectsByType, getObjectByName, getFirstObjectByType. I put ball’s gravity to 0 to handle physics movement by myself. Nothing too complex here, let’s start to create our first Citrus Engine object : a brick ! A brick is a simple Plateform which reports if something collides with it. // Take away friction so he can accelerate. The Paddle may extends Citrus’ Hero class, but I prefer to extends PhysicsObject and copy/paste some properties and function from Hero class. It is lighter. I use a kinematic body instead of a dynamic body because of collision forces : with a dynamic body, my paddle moves to the bottom after each collision with the ball, whereas with a kinematic body it doesn’t. // only change collisions that are against the top surface of the paddle (let it shank off if it hits an edge). // x distance between ball and paddle. if (ratio < -1 || ratio > 1) // it will shank. // Create a new velocity vector and set it to the ball's current speed. // set the ball to be going straight up at the same speed as it came. // rotate the velocity angle between a specific range (I chose 1 radian) as a proportion ball's distance from center of paddle. A big thanks to Eric for helping me with the ball movement ! With a restitution set to 1, the ball bounces on each Platform. Finally it was pretty easy to create my own object inside the Citrus Engine ! For a first try with box2D it was successful too ! By default, we specify a width and a height when we create an Object inside the Citrus Engine, but maybe the radius property should be added into the core to create circle easily. To conclude to this little project, I recommend to everyone interested in AS3 game development to give a try to the Citrus Engine. Moreover Eric is a likeable person who takes time to reply on the forum and help you. I’ve updated the zip file, it was saved for Flash CS5. The error comes from older CE version there was an incompatibility with FP 10.2 compiler, compiling in 10.1 is ok. Now, if you update CE’s library it should works fine! The Kinematic body type for the paddle will not detect collisions with the Platform objects. How can the boundaries of the game screen be checked against the paddle without checking the position manually? Great tutorial, by the way! It is very helpful. I think that we have no other choice here. Maybe using a distance joint but that sound over complicated compared to just check its position with the stage size.